Our Five Top Tips For Conducting The Best Job Interview! How To Conduct The Best Job Interview. Maybe you’ve had a vacancy out for a while and you think you’ve finally found the right person. Have you invited them for an interview? If you have, keep reading! These are our 5 top tips for conducting the best job interview. You need to be punctual too. 1. You need to be punctual too. We expect our candidates to show up on time, so you should be prepared to hold the interview on time too. 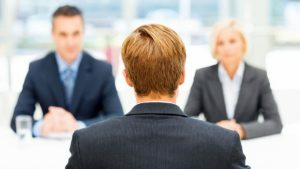 If you’re late to welcome your candidate and are rushing around trying to organise the interview 5 minutes after it should have started, are you really setting the right impression? We’d have to say no to that one. There is a good chance the applicant has taken time out of their existing job to come and see you. They might have arranged child care so they could be on time for you. Make sure you’re on time for them too. Which leads us on to point number two. 2. Create the right interview environment. Interviews can be pretty daunting. The majority of people don’t like being interviewed! Make sure you have a space that feels welcoming and puts the candidate at ease. If they’re uncomfortable or feel under pressure, you won’t get the best from them. Find a quiet, well-lit room, where the temperature is just right. Make sure it’s clean and there is plenty of room to have a sit down and a good chat. A glass of water for the candidate might be a nice touch too. Put your candidate at ease and they’ll probably impress you more! Don’t forget to put a sign on the door, or let other staff know you’re conducting an interview. That way there won’t be any unprofessional interruptions – unless of course it’s an emergency! Read through the candidates application again. Skim read their CV once more so you’re not spending time asking questions that they have already answered. There is a high chance the person coming to the interview has read up on your company. The interview should be a chance for them to elaborate on their CV, not regurgitate what’s on it. Have your questions ready, a few at least to get you started. It doesn’t need to be a rigid interview. Let the conversation flow and see what happens, but it’s nice to have somewhere to start. 4. Invite them to ask any questions. Sometimes, candidates will walk away from interviews feeling like they don’t quite know everything they wanted to. After you’ve completed all your questions, it’s a nice idea to ask them if they want to ask you any questions. They might not, but it’s nice to ask. It might be something simple that you’ve skimmed over. It might be something more complex that you’ll need to ask someone else to get the answer. Regardless, you should welcome any questions they might have. 5. Whatever the outcome – contact the candidate. If you want to hire them, great! If you don’t want to hire them, you should let them know that too. Sadly, and more often than not, candidates are often left out in the rain if they don’t get the job. Some recruiters don’t even call to let them know they were unsuccessful. Like we’ve said, it’s possible that the candidate made special arrangements to come and be interviewed. Do them the decent thing and let them know if they are successful or not. It’s always appreciated and doesn’t leave them hanging around in false hope. What tips do you have for hosting the best job interview? Let us know in the comments! Posted in Hiring | Tagged dental recruitment, hiring, how to conduct the best interview, interviewing, Recruitment, the best interview techniques, the best interview tips, tips for hiring.